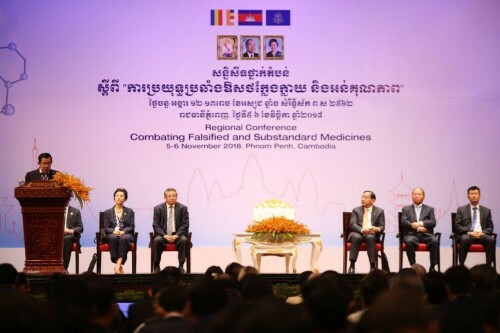 Cambodian Prime Minister Hun Sen urged authorities to impose heavy fine to those who trafficked counterfeit medicine on online market, addressing at Regional Conference “Combating Falsified and Substandard Medicines” held at Sofitel Phnom Penh on Monday. “Falsified and substandard medicines are being sold and bought online and that they are similar to the standard ones which are hard for the authority to tackle,” stated Prime Minister. The premier outlined four reasons of the proliferation of falsified medicines, including the high price of standard medicine, low management mechanisms of manufacturing and distributing medicine, low public awareness on substandard medicines, and limited capability of authorities in managing the counterfeit medicines. According to Prime Minister, these factors have allowed criminals the opportunity to take advantage of the society and threatened the welfare and lives of the people. In response to the issue, the Royal Government of Cambodia has (1) promoted the implementation and updating Health Strategic Plan 2016-2020 to improve the quality, efficiency and equity of health services; (2) promoted nationwide healthcare coverage; (3) promoted safety of health emergency services by increasing investment in health infrastructure and science technology; and (4) strengthened enforcement of laws and regulations on pharmaceutical quality inspection, and the use of chemical substances in foods, and alcohol and tobaccos.